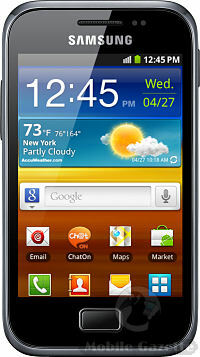 A very significant upgrade to last year's popular Galaxy Ace, the Samsung Galaxy Ace Plus is a moderately priced Android smartphone which will probably cost less than €300 when it hits the shops later this month. The Galaxy Ace and Ace Plus don't have that much in common. Inside is a 1GHz CPU paired with 512MB of memory and 3GB of internal flash, on the front is a 3.65" 320 x 480 pixel touchscreen display - the old Ace had an 800 MHz processor, 278MB of RAM and 158MB of storage with a smaller 3.5" display of the same resolution. Running Android 2.3, the Galaxy Ace Plus comes with a number of Samsung add-ons for social networking plus Samsung's TouchWiz user interface. Because this is an Android phone then it also has access to thousands of applications from the Android market. On the back is a 5 megapixel camera with LED flash, and the Galaxy Ace Plus supports 3.5G and WiFi connectivity, has integrated GPS, an FM radio, Bluetooth and a multimedia player plus a microSD memory slot. The only downside that we can see with the Ace Plus is the screen resolution. Most other similarly sized displays have around 480 x 800 pixels, more than twice the pixel count of this Samsung device. That means that certain applications, especially web browsing, may appear a bit grainy. Of course, the screen is also a lot cheaper which makes the Ace Plus less expensive to buy. One oddity with the Ace Plus is the name - Samsung changed their naming convention last year, and this might perhaps be less confusing if it was called the Samsung Galaxy M instead, but presumably Samsung want to capitalise on the success of the Galaxy Ace by re-using the name. Inside is a large 1300 mAh battery, and the whole package measures 115 x 63 x 11mm and weighs 115 grams. 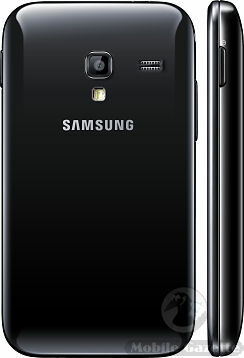 Samsung say that the Galaxy Ace Plus should be available later this month in Russia, followed by a rollout throughout most of the rest of the world afterwards.